The Vita Christi of the fourteenth century Carthusian, Ludolph of Saxony, is the most comprehensive series of meditations on the life of Christ of the late Middle Ages. Ludolph assembles a wealth of commentary from the fathers of the church and the great medieval spiritual writers and weaves them into a seamless exposition on the Gospel. This is the first English translation of this classic work, and it also is the first edition in any language to identify the thousands of sources used by Ludolph, both those he quotes and the many he cites without attribution. It will be of great interest to students of Christian spirituality, but it is intended, as was the original text, for ordinary believers seeking to enter more deeply into the meaning of the life of Christ. When complete, there will be 4 volumes. Milton T. Walsh holds a doctorate in sacred theology from the Gregorian University in Rome. For many years, he taught theology at St. Patrick's Seminary in Menlo Park, California. He is the author of several books, including Second Friends: C. S. Lewis and Ronald Knox in Conversation, In Memory of Me: A Meditation on the Roman Canon, and Witness of the Saints: Patristic Readings in the Liturgy of the Hours. "Modern readers will find Ludolph's work fanciful. This is much here for meditation, and each section concludes with a prayer. The Life of Christ is not for the gullible, but it can be recommended for lectio and spiritual reading." "This translation—the first into English—of The Life of Jesus Christ by Ludolph of Saxony will be welcomed both by scholars in various fields and by practicing Christians. It is at the same time an encyclopedia of biblical, patristic, and medieval learning and a compendium of late medieval spirituality, stressing the importance of meditation in the life of individual believers. It draws on an astonishing number of sources and sheds light on many aspects of the doctrinal and institutional history of the Church down to the fourteenth century." "Milton T. Walsh has taken on a Herculean task of translating The Life of Christ by the fourteenth-century Carthusian, Ludolph of Saxony. He has more than risen to the challenge! Ludolph's text was one of the most widely spread and influential treatments of the theme in the later Middle Ages and has, until now, been available only in an insufficient late nineteenth-century edition (Rigollot). The manuscript tradition of The Life of Christ is extremely complex, and Walsh, while basing his translation on the edition, has gone beyond in providing critical apparatus that will be of significant use to scholars, as well as making the text available for students and all interested in the theology, spirituality, and religious life of the later Middle Ages. His introduction expertly places Ludolph's work in the textual tradition and is itself a contribution to scholarship. Simply put, this is an amazing achievement! Walsh's work fills an essential gap in our understanding of the text and its world, and will be the standard point of departure for all future research on Ludolph and treatises dealing with the life of Christ in the later Middle Ages. Accessible and readable, Walsh's translation should be on the shelf of every library, and all those who actively concern themselves with the later Middle Ages will want their own copy. The first volume, here translated, takes the narrative through the Sermon on the Mount. We can only eagerly await the appearance of the rest of the work!" "Walsh has done pioneering work. 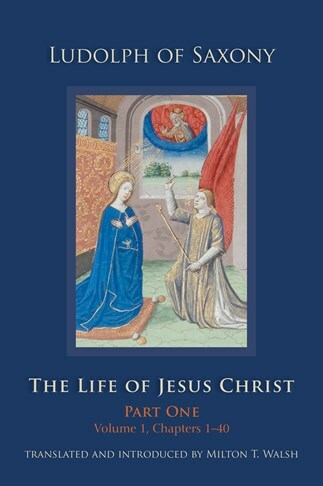 [This book] will prove an invaluable tool for scholars researching the late medieval engagement with the humanity of Christ, while simultaneously catering for general readers and religious practitioners interested in learning more about a traditional and influential imaginative meditational practice."